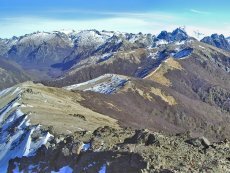 Before heading into the mountains check up-to-date trail info, & register your trek intentions with the National Park office in Bariloche, Pampa Linda or online. A very steep trek to a 1750m peak with excellent 360 degree views. If arriving at 'Tambo' by taxi it will probably drop you off at the gate on the dirt track. Continue up this track for about 100m to large clearing/car parking area, this is the start of the trail (a fee is sometimes charged for leaving your car here). Continue along the trail, after a few hundred meter there is a signpost (pointing to Cerro Bella Vista to the right), follow this traila as is climbs through the forest on a steep trail before getting steeper as you reach the treeline and arrive at the ridge. Continue along the ridge to Cerro Bella Vista. 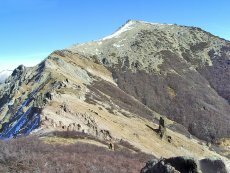 From the summit it is possible to continue along the ridge for about another 2kms to a summit thats 10m higher than Cerro Bella Vista. Return by the same route. Take with you all the water you need for the day. One day trek, no camping or refugio options. The best option that I personally use is to take the local bus to KM 12,5 on Bustillio then take a remis to the trail head. 'Remises Bustillo' (0294) 4463003. A Remis is just like a taxi, but it has to be reserved by phone or at their office. If finishing your trek at 'Tambo' it's about 6kms along a gravel road to the nearest bus! If you have a cell phone you can call 'Remises Bustillo' (see above). SECURITY NOTE: There have been a number of robberies over the last few years of people walking along this gravel road from the trail head back to the main road. If arriving by car you can park in grassy clearing at the trail head. Sometimes a small fee is charged. The information contained on this website is no substitute for a qualified Mountain Guide and the site author accepts no responsibility for inaccurate or outdated information (nor omission of information), nor any accident or injury sustained while carrying out the treks described here. This website has no affiliation to any of the refuges. All times and distances are approximate. As an Amazon Associate I earn from qualifying purchases. Nahuel Huapi National Park, Trekking Guide to Bariloche, Patagonia.